Tooth decay or cavity is a disease that destroys the structure of teeth. If left untreated, it can lead to, sensitivity, pain and infection and in severe cases, tooth loss. Bacteria in the mouth feeding on sugar from diet/food produce acids that destroy tooth structure creating a “hole” in the tooth, otherwise known as cavity. Yes! Decay which starts on the sides of teeth can spread to the adjacent tooth if left untreated. 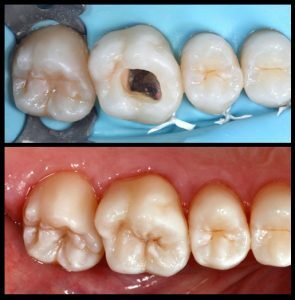 If detected at the earliest, tooth decay can be treated by simply filling the cavity with tooth colour materials. If the decay is extensive causing pain or swelling, a root canal treatment is recommended. What are the dental filling materials that are used? The most commonly used dental filling materials are silver amalgam, GIC (Glass Ionomer Cement) and composite (tooth colour) materials. No conclusive proof of silver (amalgam) fillings being toxic, if properly performed, has been found. However, with the introduction of newer filling materials, like GIC, resin or composites, amalgam is not used as often as it once was. SmileSense Dental Clinic uses the latest and safest material for your fillings. We currently don’t use Silver Amalgam for your regular fillings. What are resin or composite filling materials? They are the latest tooth coloured filling material today. More than 90% of all fillings nowadays are done with resin or composite materials. How long will a dental filling take? It usually takes around 10 – 15 minutes for filling a tooth. Will I require Local anaesthesia?